June 25 to September 3, 2018. From fresh produce to unique handcrafted collectables, we have something for everyone! Be sure to drop by the Bala Farmers’ Market, to take home your own piece of Muskoka. Come Savour the Flavour of Muskoka. Established in 1992 in the heart of Ontario’s scenic cottage country, the Gravenhurst Farmers’ Market has become one of the region’s most popular attractions. Offering a fantastic selection of locally grown produce, delicious fine foods and handcrafted artistry! Come to shop and stay to play, Hanna Park offers an amazing beach and playground. Come by boat or by car, parking is available for both. Come discover those special delights that will tease your taste buds and compliment your table. Experience our fresh produce, smoked meats, superb baking, juried work by artists & artisans, and much more, all prepared with pride and attention to detail, and with the highest standards. This lively market boast a nice array of vendors selling fruit and vegetables, organic produce, honey, fish and seafood, baking, arts and crafts and Thai food. 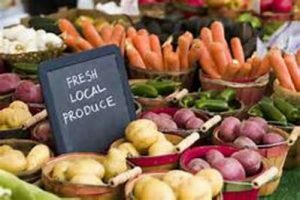 The Bracebridge Farmers Market runs every Saturday from the Victoria Day long weekend in May, until the Canadian Thanksgiving weekend. Come and visit us in beautiful downtown Bracebridge. We are located in Memorial Park on Manitoba Street, next to the Norwood Theatre. All products are locally grown, made or produced within 100 Km of Huntsville. Organic meats, vegetables, maple syrup, cheese and artisan products. A festive atmosphere with music and lots to see.